Lumiere London is back for 4 nights and the opening night in Thursday was blessed with a crisp clear sky. 54 illuminated installations split into 6 kind of distinct areas are visible from 5.30pm until 10pm, you’ll never do it in one night. Here is a snapshot, literally, of a few of the installations around Mayfair and the West End that blew my photo neurons on the first night. Cédric Le Borgne – Was That A Dream? There is a more comprehensive recollection on Graffoto, including more of the installations enjoyed last night. At the time of writing (Friday morning) there are another 3 nights left to run. More information on the Lumiere London website, I tried the free App, the download map (contribution required) and the physical map available from vendors at various locations for £5, the hard copy map; was by far the most convenient for navigating a lot of the back street mazes navigating from one to the next. It is street art, just not the tye Shoreditch Street Art Tours usually focusses on! This entry was posted in News and tagged Art, installations, Lights, London, Lumiere London 2018, Mayfair, West End on 01/19/2018 by Shoreditch Street Art Tours. It’s not street art as we would normally look at but it is art on the streets. And in parks, and in Trafalgar Square, and it is fun. Lumiere London launched this evening and runs for the next 3 nights to Sunday night. “Les Lumineoles” by Porte par le vent literally did dance in the breeze weaving a dreamy tapestry of colour. I got around just over a half of the installations and loved them all. Crowdstopper and road blocker of the lot is on the façade of 218 – 222 Regents street where Keyframes, a matrix of animated light stick figures by Groupe LAPS dance and cavort over the building to a bleeping symphony of computer game musical sound effects, quite mesmerising and the conclusion of the cycle drew a deserved round of applause from the 100s gathered to watch. You can’t go wrong with goldfish. The lights which have illuminated to top of the landmark office block Centre Point towering over Tottenham Court Rd tube station have been relocated to Trafalgar Square, a far more appropriate location since this is historically where all distances from London have been measured. I have a soft spot for Julian Opie’s Shaida Walking as an edition version of Suzanne Walking adorns our wall at home, his “RUth Walking In Jeans” has been illuminating Regents Place in Euston for years but sadly is often static or malfunctioning. “Light Graffiti” by Floating Pictures at Kings Cross is described as technology which converts a moving source of light into lights projected onto a building, I will reserve judgement on the appropriate use of the word graffiti until it proven that it is possible to paint comedy male anatomy. Await updates. This entry was posted in News and tagged Art, colour, illumination, light, London Lumiere, neon, Street Art on 01/15/2016 by Shoreditch Street Art Tours. Over the past Summer some guests on the Shoreditch Street Art Tour were introduced to an unusual interaction between street art and flyposting. 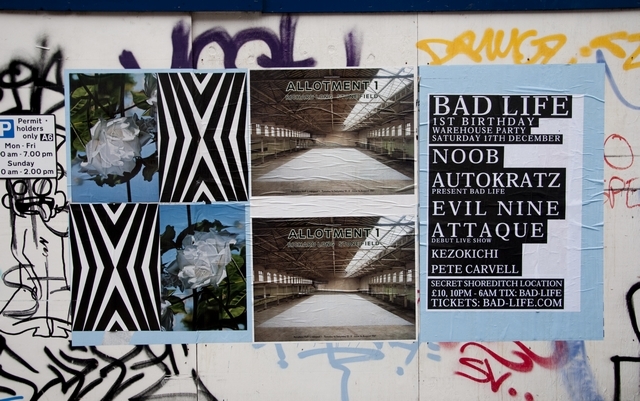 The artist Mustafa Hulusi turned illegal adverts on walls into art by declaring them “A Retrospective of Flyposting”. This was clever and amusing. This month, Mustafa Hulusi has an exhibition in a space in the East End called “Flyposting”, a collection of art imagery and signage which Hulusi has put up on street walls since 1998. Since I first became aware of Hulusi in 2008 when he participated in a panel talk it has been a pleasure to find and photograph Hulusi’s art on the streets, always paste ups and always the same size as standard flyposting formats. Do hurry, the exhibition only runs until the 30th of the month. This entry was posted in Artist and tagged Art, Cass Bank Gallery, flyposting, London, Mustafa Hulusi, retrospective, Shoreditch, Street Art on 10/27/2015 by Shoreditch Street Art Tours.